I am participating in A to Z Challenge 2014 where we write 26 posts in a month each day on one word from A to Z barring Sunday's. 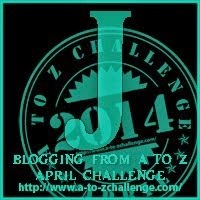 Today's word is "J". I chose to market my blog through a jingle, as they say jingle is the best way to do it. The tone for the jingle is based on this ad jingle of Nerolac Paints. That jingle's going to stay in my head all day. I love the sing-song feel of this. Thanks for sharing!